Oh Baby, it’s hot outside! Summer in the Central Valley of California typically means day after day after day of 95 degree + heat. (Right now we are in the middle of a 10-day 103 – 107 degree stretch!) No wind, no rain…just heat. Errands, gardening, and outdoor chores are done very early in the morning or well after the sun goes down (good landscape lighting helps with the latter). If we can help it, we don’t go out during the day except for the short foray from the air-conditioned house to the air-conditioned car to get to the next air-conditioned building. In short, we adapt to our environment. And we humans are not the only ones to do this. What exactly is a succulent? I think the authors of Dry Climate Gardening with Succulents define it best: “…succulence is usually a storage adaptation of plants that have evolved in situations where fresh water is at a premium and must be conserved…” And it is not only desert plants that have had to adapt. Plants growing near the beach must be able to utilize less water as the readily available water is too saline for most plants to grow. Even in the rainforest, plants like orchids and bromeliads, which live high in the forest canopy, have had to adapt to less water due to the fact that the water available to them must be captured as it runs down the trunks of trees. Another way succulents survive is through defensive mechanisms. Just think of the spines on those nasty looking cacti like the Blue Barrel Cactus. 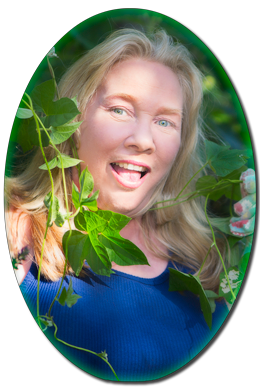 Wait, I can hear you now – you thought I was writing about succulents, not cactus! All cacti are succulents but not all succulents are cacti. So there. Now, back to where I was…those spines on cacti can ward off predators. Also, the tough skin on many of these plants tend to discourage pests. Some succulents have very unique attributes to help them survive. 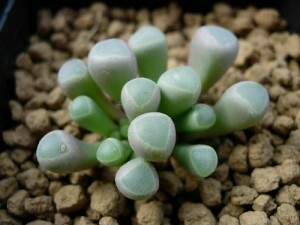 Look at this little cutie, Baby Toes (Fenestraria rhopalophylla). There are as many adaptive capabilities as there are succulents. Future posts will include detailed information about many of my favorites. How Do You Keep From Killing The Survivor? A quick trip to the nursery will show how popular succulents are becoming here in the valley. Used to be there would be one little shelving unit holding succulents. Now, I see long pallet rows of them for sale. Coincidently, the surge in interest seems to have coincided with mandatory water meters for many of our city residents. Go figure. 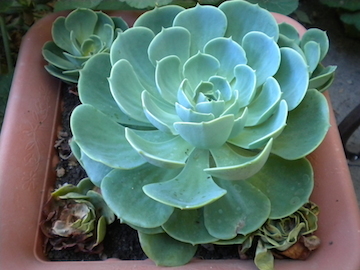 Remember, the succulent’s succulence is due to the fact that it stores water in its fleshy leaves or stems. They don’t need to be watered as often as other plants. I have a 20-year old Jade plant that I water about six times a year. Yes, you read that correctly – a year! The best practice is to err on the side of underwatering rather than overwatering. The correct amount and intensity of light given the plant is also important. Cacti can take full Central Valley sun. The featured photo at the top of this post is my Cactus Wall (Photo courtesy of Rick Horowitz at So Shoot Me!®). The plants get full summer sun until about 4:30 .p.m. And to make the environment even hotter, in front of the fence is a concrete RV pad. No relief from the heat in sight but these guys can take it. Non-cacti succulents, on the other hand, typically need bright, indirect light. Don’t put them in the hot sun! Case in point: While grilling some salmon on the barbie last night, I was checking out the nearby plants and noticed parts of my Echeveria were all shriveled and brown. (See the little ones in the corners of the pot.) I had several pots of this beautiful plant in a spot where I thought they were getting only filtered, morning sun. But unbeknownst to me, the lighting had changed over the last month or so and now the plants were getting fried by intense early afternoon sun. The pots were moved immediately and much happier Echeveria now reside in a more sheltered area of the patio. How Do You Make Babies and Save Money at the Same Time? Seems like an oxymoron, right? Everyone knows when you make babies, you are definitely not going to save any money. Except, that is, when you’re talking about new baby succulents! New plants can be made by propagation which will save costly (if you’re anything like me) trips to the nursery. There are several different methods to make new plants. These include: cuttings, division, seeds, and grafting. I make my new plants mostly by cuttings. 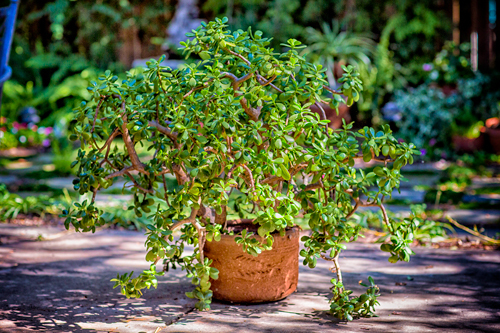 It’s quite easy and should you have family and friends who enjoy succulent gardening, too, you can trade cuttings and amass quite a collection for next-to-nothing in no time. Propagation by cuttings is done by cutting the leaves or stems of the “mother” plant and planting them in new pots. Simply cut a portion of the stem of the plant and leave that “cutting” to sit for at least three days or more depending on the plant. 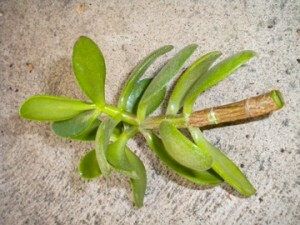 This allows the end of the cutting to callus over which will prevent the plant from rotting when repotted. Next, place the cutting into a small pot filled with potting mix that is not too heavy and which drains well. Many succulent gardeners mix one part potting soil with one part perlite to achieve the desired potting medium. In a couple of weeks, roots will form and your new baby will be well on its way to being a happy and healthy adult. How Do You Stop Once You Start Collecting Succulents? Sorry; no help here. It’s nearly impossible. It’s addictive. Seriously.